BEAUFORT – Sixth- through eighth-grade girls can build a virus, explore stormwater issues, navigate robots through mazes, visit a living shoreline and even learn how to create a carbon dioxide-rich atmosphere in a cup and watch it change the water beneath it during Girls Exploring Science & Technology, or GEST, on the campus of Duke University Marine Lab. 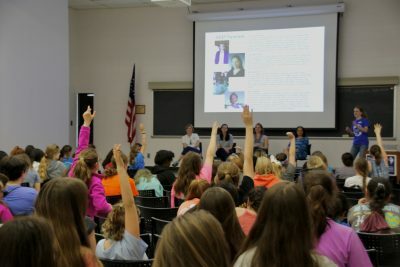 Set for 9 a.m. to 4 p.m. April 13, GEST, a collaborative one-day event, provides the chance for middle school-aged girls to engage in hands-on science and technology activities and meet women with careers in science. Registration is now open for the inclusive event. GEST welcomes all female-identifying and gender nonconforming students. 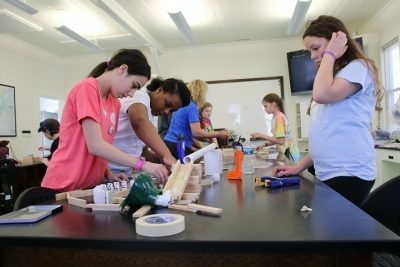 During GEST, the girls are split into groups and taken to three different hands-on activities of their choice related to science, technology, engineering and mathematics, or STEM. The day will kick off with a talk from a woman in a science-related field and close with a panel discussion with female scientists and instructional workshop about preparing for futures in STEM. Lunch will be provided. Ashley Blawas and Anastasia Quintana are coordinating the event along with volunteers, staff and master’s and doctoral students. Blawas is a first-year doctoral student in marine science and conservation with a focus on marine mammal physiology and Quintana, a social scientist, is a fifth-year doctoral student studying cooperation and conflict between fisheries and conservation. “I think girls in science is a really important,” said Quintana, who co-founded GEST with another DUML student about five years ago. The first GEST was held in 2016. “I’ve been here since day one,” Quintana said, explaining that GEST is a way for sixth- through eighth-grade girls to interact with women in STEM fields. This age group was chosen, Quintana explained, because there is a lot of evidence showing that girls in middle school begin to underperform in science. When younger boys and girls are asked about their performance on a science test, they answer fairly accurately as to how well they performed. When girls reach middle school, they begin to underestimate how well they do on testing, and then they begin to underperform. 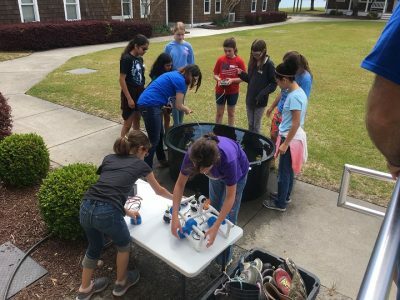 With GEST, they wanted the middle school girls to see women in science and know that “science is fun and I can be a scientist,” said Quintana. An undergraduate student at Duke last year, Blawas served as a group leader, and as PhD student this year, was eligible to join the planning committee. 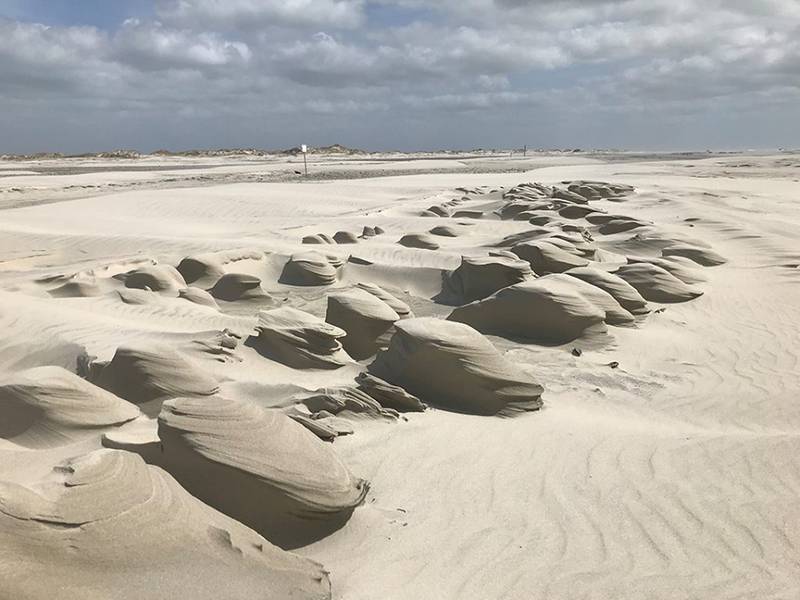 She said that several organizations are involved in GEST, including folks from NOAA, Rachel Carson Reserve, North Carolina Coastal Federation, students from UNC-IMS and CMAST and more. There are several activity leaders from the area as well as females in STEM-related careers based in the triangle. 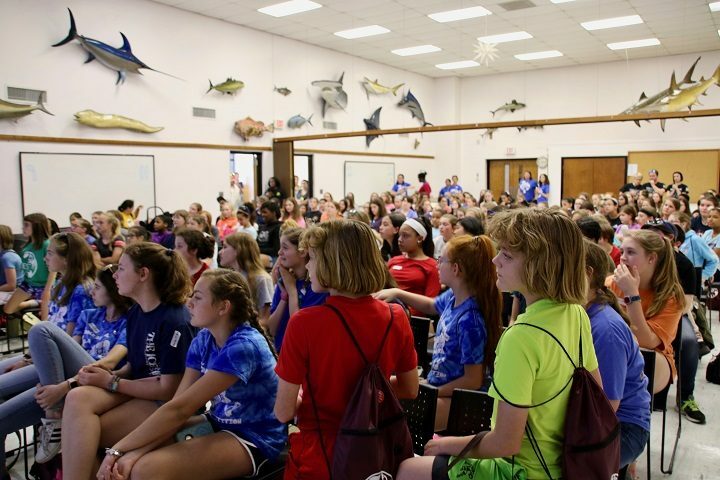 Blawas said that bringing in women in STEM-related careers from the Raleigh-Durham area who may study different animals or organisms is a way to expose the girls to a wider range of STEM beyond a marine focus. As of Monday, more than 200 students had registered and they’re looking to cap at around 240 participants. “Every year, we’ve reached capacity, so it’s really exciting that we’re reaching that many girls around the communities,” Blawas said, adding that organizers are working to increase capacity each year and come up with creative ways to use the space on the island to allow for as many activities as possible. One highlight from last year for Blawas was the reaction of her group during the squid dissection. Blawas said during the activity the girls could touch the squid, not just look at a paper and see a diagram but be able to participate in the dissection. Her group had a blast, she said, adding that some of the girls were not squeamish and really into the activity, but others were cautious. “I think the hands-on aspect of the activities is really engaging,” Blawas said, adding that she thinks those types of hands-on activities are the best for kids to see that science is a career option. Lori Davis, education coordinator for North Carolina Coastal Reserve, leads the squid dissections for the GEST event. Davis said she chose squid to dissect during GEST because it is an animal that can be easily dissected in a short amount of time and the animal is fun to examine with its suckers and tentacles. 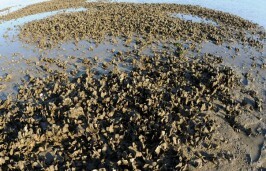 Davis said that after the squid are dissected, the pieces are put back into the water to enter the food chain again. New this year are junior group leaders, former participants that are now in high school. “We hope within that, they see people who have been to the event before and have been impacted and want to come back, and teach them what they learned,” Blawas said. Quintana added that they’re still adapting the event and one of the more important things they’re realizing is that the event helps students get to know girls in the community and create a relationship between Duke and local middle schools. Duke in Durham has many outreach events for students living in and hear Durham, but for those students that live in Carteret County the events in Durham aren’t very accessible. 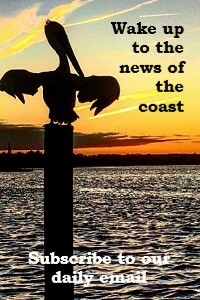 “So one of the goals in having an event at Duke Marine Lab is offering local students the opportunity to come to an academic university setting,” said Blawas.